The idea of a typewriter first began not only as a way to communicate more quickly but also to aid the blind in communication. Yet, in the three articles I selected for this post, no mention of a typewriter adding the blind was mentioned. For my post I'm focusing on the machine as a method of communication for journalists, writers, and work in the office. The invention of the typewriter didn't receive international acclaim or attention like other inventions of the time such as the automobile or the telephone. One possible reason is that it was designed for work, not socializing. 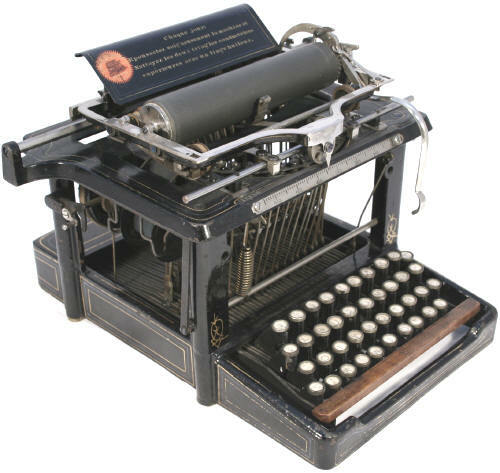 The first patent for a typewriter like machine was issued in 1714 to Henry Mill of England. Unfortunately, no example of his work survives. William Burt, of Detroit, Michigan patented his machine, called a typographer in 1829. It was designed with characters on a rotating frame. Burt's machine and others that followed were not successful as they were hard to use, cumbersome, and often took longer to produce a letter than if writing by hand. Christopher Latham Sholes of Milwaukee, Wisconsin, together with Carlos Gidden and Samuel Soule, patented the first useful typewriter. His patent was licensed to a well-known American gun maker and in 1874 the first commercial typewriter, the Remington Model 1, was placed on the market. Thomas Alva Edison, using the Sholes model, built the first electric typewriter in 1872 but the machine didn't become widely used until the 1950s. Many different types of typewriters were developed in the 1880s, but the one designed to resemble what we are familiar with today was the Underwood No. 1, invented by F. X. Wagner. It was the first typewriter to strike the front of the planten and users could see what they were typing. My focus today is on the Remington Model 2 shown in the picture to the right. This is the model my heroine, Dessa Wade, receives as a gift in my newest short time travel, A Marshal of Her Own. It's set in 1890s Prairie, Texas and is a sequel to A Law of Her Own available from The Wild Rose Press and other online book stores. If you look closely at the picture, you can see there is no shift key and you can only type in capitals. Shole is also famous for the QWERTY layout used today. Like the Remington Model 1, the Model 2 continues the up-strike tradition. The keys hit the planten at the bottom so you cannot see what you're typing. Still, the Remington Model 2 is the first commercially successful typewriter. It wasn't until 1908 that Remington changed to the front strike planten with the Remington Model 10. I learned to type on an old Underwood typewriter. Using one required strong fingers and I could pound out about 70 words per minute. Vintage typewriters are in style again, at least for writers who'd like to have one in their office for decoration. As I read a Regency romance, I inevitably reach a scene that involves money. All those pounds and pence and shillings are indecipherable to my American mind. So, I translate, or try to. I see "pound" and read "dollar". 200 years ago, as today, a British pound never was equivalent to an American dollar. So, what was British money in the Regency? Money came in the forms of notes and coins. In general, notes were for larger denominations, up to 1000 pounds, and coins were for the smaller denominations. In Regency times, the lowest denomination of notes was 1 and 2 pounds. For smaller amounts, coins were used. The Royal Mint issued coins, and a bank issued notes. The Bank of England had issued notes from its inception in 1694, and until 1844, regional banks could also issue notes. Note that a guinea is more than a pound. Here's a good link with most of the above information. Guineas, sovereigns and half-sovereigns were gold. Crowns, half crowns, florins, shillings, sixpence and threepence were silver. The pennies and farthings were copper. Most Regency financial transactions involved coins, even though one and two pound notes were available. Why? Because a Regency pound was a lot of money. The Worth of Regency Money is my next post. Note: the picture above shows the newest designs of British money.